Struggling to call these shrimp - 4 of them weighed in at 3/4 pound. Marinated for a couple hours in Pina Colada mix and Malibu rum, then split them part way, filled with backfin crab meat lightly seasoned with just salt, pepper and lemon juice. 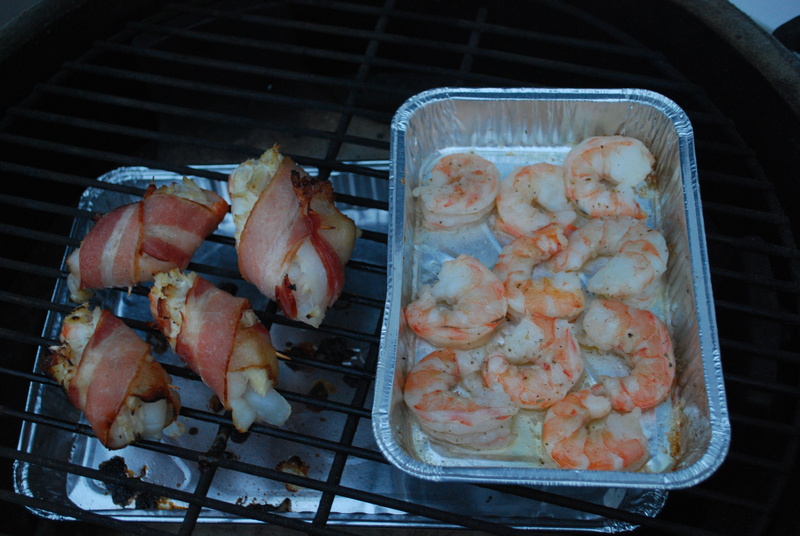 Wrapped in bacon to hold it all together then cooked indirect at 400 for about 15 minutes (Nuked the bacon for 45 seconds to get it started because I didn't want to over cook the shrimp). Had some normal sized shrimp (16 - 20/pound) done as scampi with garlic butter. Served with a Pina Colada dipping sauce, made from cream cheese fruit dip, crushed pineapple, pina colada mix and shredded coconut. The crab stuffed shrimp were amazing. These look delicious, but I would have to skip the Malibu marinade (for legal reasons). I am now jonesing for these! Thank you. Struggling to call these shrimp - 4 of them weighed in at 3/4 pound. Looks delicious. Where did you get those shrimp? Got them at the local grocery store. They were '6 - 8 count'. I had them pick out the 4 biggest ones. You sure those are shrimp and not small mermaids or something? This sounds great, I might have to try a version of this. I had a huge thing for "deviled crab" as a kid so maybe stuffing some shrimp with that. I would love to meet their brothers. I am a very friendly person. This is my friend, Jamal. 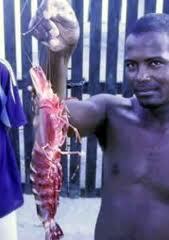 He likes big shrimp too.